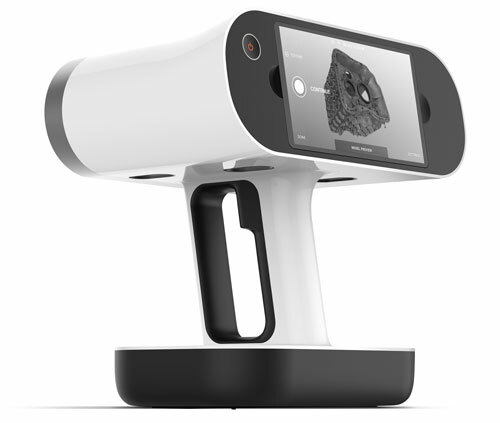 The new Artec LEO 3D scanner from Exact Metrology, Inc. can scan both expansive areas and fine details, as well as a variety of objects, including small parts. Offering onboard automatic processing with an integrated touch panel viewer, the handheld scanner frees users from being tied to a computer for data capture. The scanner features a rapid 3D reconstruction rate of 80 frames/sec., reportedly making it the fastest professional scanner on the market, and provides a large field of view. Data acquisition reaches to 4 million points/sec., with a working range of 0.35-1.2 m. It provides 3D resolution to 0.5 mm and 3D point accuracy to 0.1 mm. State-of-the-art technologies incorporated into the Artec LEO include its internal computer, the Nvidia Jetson platform, and a built-in 9 DoF inertial system, including an accelerometer, gyro and compass, that allows the scanner to understand its position and environment. And, and a two-in-one optical system is designed to specify the most exact texture-to-geometry mapping. The scanner is equipped with a 4-in. LCD screen to capture data images, with the 3D light source provided by state-of-the-art laser technology. With no need to connect to a computer or to plug in to a main power source, users can hold the scanner and walk around freely, scanning without worrying about wires or additional equipment. Artec LEO’s battery pack allows users to scan for 3.5 to 4 hr., while supplementary battery modules permit unlimited 3D scanning in remote areas.